A new study has found that students who played a math game competitively or in co-op had an easier time learning the subject. Math has been a nemesis of mine for pretty much my entire life. I was awful at it college, horrendous at in high school and the less said about my struggles in elementary school the better. Suffice it to say that the finest minds of the upstate New York education system just couldn't help me. 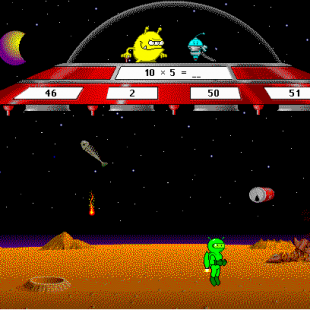 The only bright spot that I can recall in my career as a mathematical failure was the game Math Blaster. I always looked forward to playing it when our teachers would trudge us down to the computer lab for each week for an hour edutainment. Of course, even back then, I never assumed it was actually helping me very much. It was, after all, a videogame. That said, if some recent research can be believed, I might have been getting more out of Math Blaster than I thought. A new study has found that educational games can be helpful in "[motivating] students to learn less popular subjects," math included. "Game-based learning can actually get students interested in the subject matter and can broaden their focus beyond just collecting stars or points," said Jane Plass, a co-author of the study and professor at New York University's Steinhardt School of Culture, Education, and Human Development. Games, the study posits, can be useful in helping students reach a mental state where they're more open to learning. "[They] help circumvent major problems plaguing classrooms by placing students in a frame of mind that is conducive to learning rather than worrying about how smart they look," added Paul O'Keefe, another one of the study's authors. The study determined this by monitoring students as they played FactorReactor, a math-based game. The research found that the games were actually effective in helping students learn certain subjects. Moreover, the results revealed that participants while played the game with another person or competitively did better than those who played alone. In other words, if we could find a way to combine reading, writing and arithmetic with Call of Duty, American's education problems would pretty much be handled.